Lyn Oswin is the owner and creative force behind Enchanted Floristry. She is passionate, talented and an innovative floral designer and stylist, qualified from City & Guilds, Judith Blacklock, Tallulah Rose and Covent Garden Academy of Flowers. Although able to turn her hand to most creative genres, it is with flowers that Lyn really showcases her artistic ability. Enchanted Floristry was born out of a complete love of flowers (some might even call it an obsession!). Sit still for long enough and Lyn will cover most things in flowers! And the bigger the project is, the better! Lyn has a wonderful, novel and inventive use of produce, to design and craft wonderful impactful displays for weddings and other special occasions. She is always on the lookout for different ways to give couples the WOW factor at their weddings. Her striking moongate wreath is a prime example of a customisable statement piece that can be made to look unique for each event. 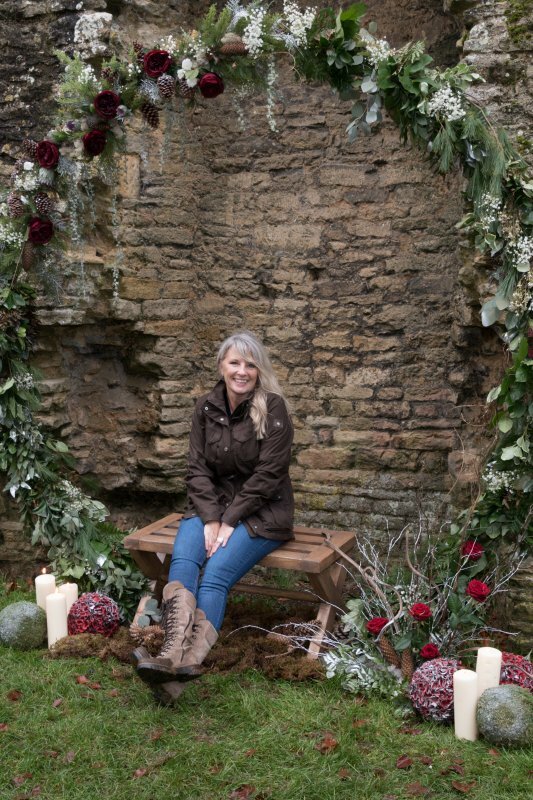 Lyn can often be found foraging in local hedgerows for foliage and flora, utilising fruit and vegetables, and keeping an eye on trends to incorporate new things in your wedding scheme such as feathers, succulents and air plants. Enchanted Floristry endeavours to support local produce and sustainable options in their creations where possible. So, as well as real floral art, they also offer artificial flowers which can be incorporated in to displays alongside real flowers or used on their own. Great alternatives for the environment and the pocket. And every now and then you might come across a lonely bouquet left locally by Enchanted Floristry to bring a smile to someone’s face. Keen to match your Pinterest expectations with realistic budgets, Enchanted Floristry offer a bespoke and personalised service delivered without an inflated price tag. They are not your conventional high street florist but a floral designer offering only tailored commissioned projects. Lyn prides herself on working closely with her clients from start to finish on every aspect of their order. Her flexible attitude and reliability ensure couples are well looked after and highly recommend her services. The 5 star reviews are testament to the quality and care shown to couples by Enchanted Floristry and Lyn always strives to enhance a wedding day in any way possible and do her bit to make it a very special day.